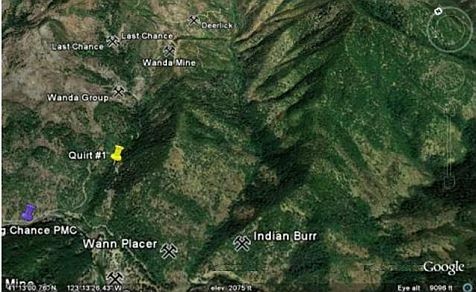 What one most often finds in any historically productive placer gold mining area is all the accessible good (mineral-in-character) placer ground is staked up, and has been for decades with title maintained. In other instances, some unclaimed land may be "mineral-in-character", but the deposit is situated in extremely rugged utterly inaccessible terrain, steep-walled canyons, sometimes without even an access trail, and/or miles from existing roads. This is a rare opportunity to own a contiguous collection of gold properties with history of a significant surface pocket discovery, two (2) known tunnels, three (3) known mines, and approximately 2,000 ft. of river that is historically known as one of the richest gold producers in the United States, - A region where Claimants find gold in paying quantities, rather than just specks of color. No-where are you likely to find a better opportunity for owning an outstanding combintaion of gold mining properties such as this, located in one of the richest gold mining regions in America. 400-acres prox., that predominately remains virgin, and very rich in gold. Located right in the heart of some of the richest gold country in America. The Ancient River Channel runs right through this gold property. The Ancient Rivers of Gold in northern California are from the Tertiary Period. The tertiary rivers existed millions of years ago and many of them had large quantities of gold within their gravels. They are known as; "The Ancient Rivers of Gold".